Didn't last half as long as his roommate Anthony Lawson. Was it you who told me or did I tell you about Anthony Lawson, the UK asset protection firm? I found the corporate site a while ago, but after you thoroughly dismantled his "anti-nose-out" garbage, it disappeared. Now all I can find is an address. I figure Anthony Lawson is just the maritime legal name for a hired asset-protection corporation disguised as an individual human web content creator. If you try going to the old site http://www.anthonylawson.co.uk it says site is "temporarily unavailable"
Should we give them a call and ask the name of our lovely voice actor on that simply brilliant video that "debunked" Simon Shack? A map - appearing to pinpoint the place if it really does exist in North London. Not that long ago he used to live in Thailand, I wonder what the attraction was. @dnbmonster1: I've blocked you, but for your own benefit, explain to yourself what a Boeing 747-sized engine was doing coming out of a﻿ missile and landing in Murray and Church St. Shack has never addressed this embarrassing FACT, he only deals in unsubstantiated theories. 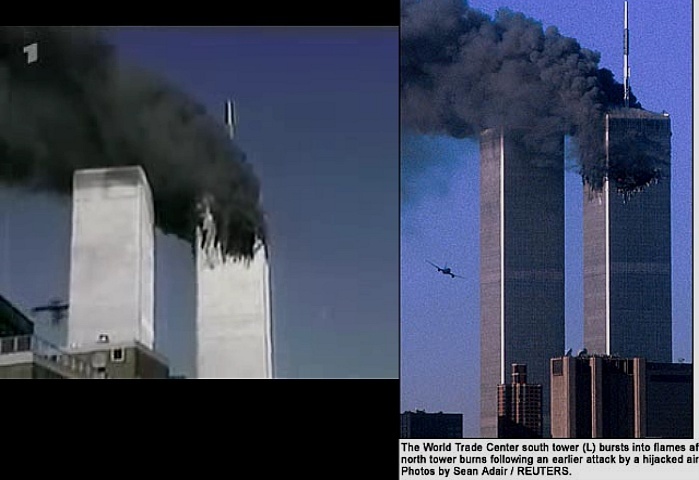 A big aircraft engine, which hits a tall building on its way down from the South Tower is not a myth, or the result of CGI. Learn to look into things for yourself. simonshack 4 Jun 28 2010, 02:24 PM wrote: According to Anthony Lawson, a "Boeing 747-sized engine" was found in Murray and Church street. Ha ha...I went over to "SEPTEMBER CLUES BUSTED"
Good grief! :D I don't know the name of this kind of "What's that got to do with it?" logical fallacy, but...doh! ...has not yet watched the 2008 version of September Clues ! Your condescending manner is not encouraging, so try to go easy on it. I have been made aware that you reinstated the words you edited from Theresa Reynaud's statement. But have you ever explained why you took them out in the first place? Tampering with evidence is rather like opening Pandora's box; once such a lie is﻿ established, in people's minds, retracting it doesn't do much food. And why would I want to watch the 2008 version? What other changes have you made? The lazy old fart ! I solemnly declare Anthony Lawson and his "September Clues Busted!" hit piece, definitively buried in the dungeons of shillery. Ok - enough is enough: It's about time to call out Lawson for the all-out fraudster that he is. Please stop this video at 8:12 - As you see, Lawson puts a white arrow on a black blob (supposed to be 'the plane'). Now, I have 4 versions of this FOX clip (from different sources) - all in similar or higher resolution. THERE'S SIMPLY NO BLACK BLOB to be seen﻿ in mine. Yes, I do realize this is a case of my word /against Lawson's word. All I can say is: do your OWN research, people! And if anyone wonders why﻿ I didn't point this out a long time ago, it has just been a choice of mine not to indulge into such 'pixel fights'. Since the army of shills deployed against September Clues just love to start controversy and infighting. Moreover, of course, September Clues is certainly not only about FOX's nose-out disaster. So I've kept silent (maybe for too long) about Lawson's silly little black blob insertion. But the time has come to say: enough is enough. You're busted, Lawson. NO PLANE IN WIDE SHOT! ANTHONY LAWSON INSERTED IT HIMSELF ! 1) So an eye witness contradicts an anchor, or another anchor contradicts for a moment the script. So what. These details were not "conveniently ignored" by Simon Shack, as much as they were meant from the beginning exactly to prevent arguments of a future Simon Shack. Lawson does not consider the simple proved fact that contradictions and slip-ups where buried into the story from the beginning. By keeping researchers scratching their heads about details and contradictions, they made sure we would not consider for a long time the simple possibility that the whole thing was fake, TV fake, because it had elements into it in support of one conspiracy theory or the other. 2) The nose-out does not perfectly match? It matches enough to be completely unreal. In any case, it is completely unreal for an aluminum plane to go through a steel tower. I repeat, a steel tower, not a glass tower. One of the historical contributions of September Clues is to allow us to get "out of the box" and start to rationally and accurately consider the possibility of fakery. Of course the 9/11 fakery has an almost infinite number of elements to it that cannot all be considered in one video. How about getting up-to-date with the research, Lawson? 3) So one douchebag anchor gives us an explanation for alleged power disruptions during the nose out incidents. How is this to be trusted, when we assume they are all onto the scam? The douchebag anchor is just trying to cover for the previous mistake is all. 4) As to the blob of pixel that might or might not be there in the zoom out (I don't have the original official footage of that, and I can't find it in the 9/11 tv web archive), it is being argued enough by Simon on the youtube page, but I don't see any difference anyway since the whole footage is fake. Even if it was there, it could have been added graphically anyway, so what's the deal? Lawson blabs about the "overlay only being viable" when the camera zooms in, but this argument could be sort of valid only at an early stage of the research, when it was assumed that the film of the towers could be real, and the planes superimposed. 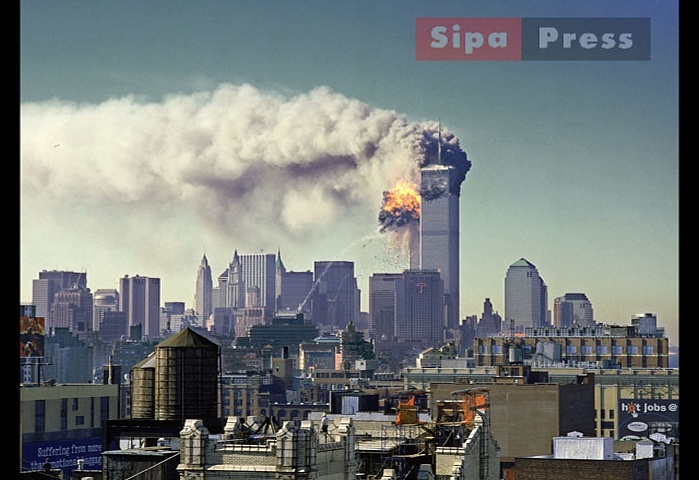 It is much more logic to think, in fact, that the towers and the smoke were a composite as well as the planes, and the errors were only due to the need to create the composite image live (with a 17 seconds delay, actually) in synch with real explosives or directions of wind. So the point is irrelevant anyway. NonCap Lawson isn't worthy of your excellent insights above, he's just another Cog in the broken wheel of disinformation (His 911 beliefs are on par with the Jones'z and Avery'z... OH NO that Sept Clues research is hogwash, same old broken record! )The guys DORKY voice alone is enough for a Skull Bashing He conveniently leaves out Mountains of evidence for no planes and fake victims! Anthony Lawson wrote: By the way are you still touting your absurd video about the moving bridge? Have you worked out why that optical illusion could have occurred, by looking up some information on the visual distortions caused by long lens photography, and a very simple-to-understand phenomenon known as motion parallax? Or do you still think some inept graphics operators made a mistake and caused the bridge to move in that sequence?" 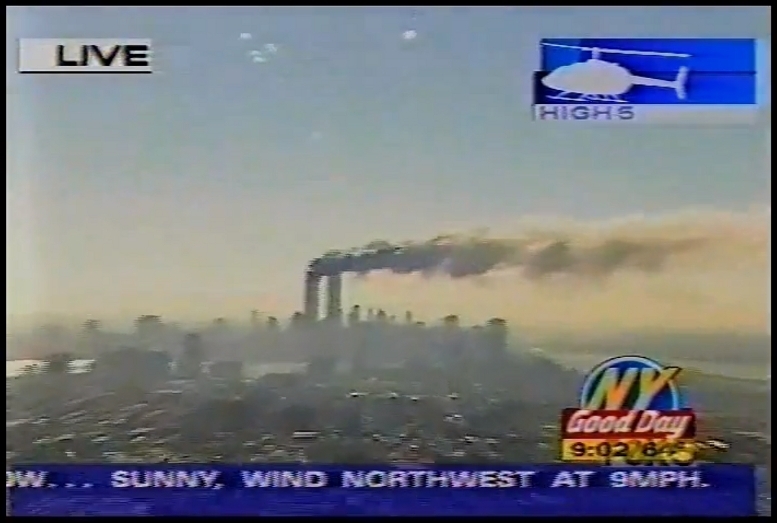 To the right: The Verazzano bridge as depicted in a private pre-9/11 aerial video. It has been argued that this ridiculously big aspect of the Verrazano seen on LIVE TV on 9/11 could be easily explained by a well-known optical phenomena called 'lens distorsion' - or by parallax-related issues. Sure enough, when using a powerful telephoto zoom lens, objects in the backdrop will appear larger than with a 'shorter' lens (such as a standard 50mm or a 24mm wide angle lens) - no question about that. The question is - BY HOW MUCH? And is it conceivable that the 2 shots above were shot with totally different lenses? In the above comparison, the Verrazano bridge in the ABC shot appears roughly 3.3 times larger/wider than in the private pre-9/11 shot - yet the foregrounds of the 2 shots are framed in almost identical fashion. The problem is: at the end of this sequence, the zoom-out motion stops. Yet, the bridge continues to drift sideways at brisk rate - while the 'helicopter' appears to be almost stationary (see foreground buildings). - The distance of the Verrazano bridge from the WTC is/was almost 12km. The one at right is the so-called "DIVEBOMBER shot" - as aired on CBS. I don't think there can be any debate here as to the fakeness of AT LEAST ONE of the 2 videos above. But let' see what Mr Lawson has to say.